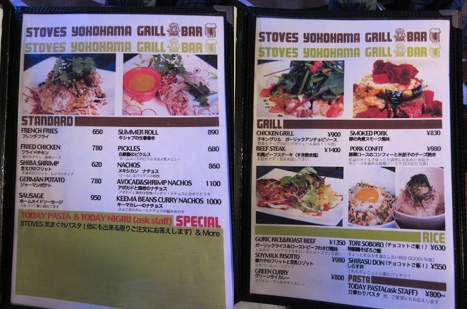 I’m in the Tokyo/Yokohama area of Japan and having some truly mind blowing meals (and no, the whole town is not radiated and there is no need to fear the foods of Japan – the Japanese are particularly meticulous about safety and quality). Chefs here cook from a completely different point of view, have excellent training, are able to dine in some of the world’s finest restaurants of all styles and cultures and have access to ingredients of impeccable quality – so their approach is very refreshing, if you have an open mind. 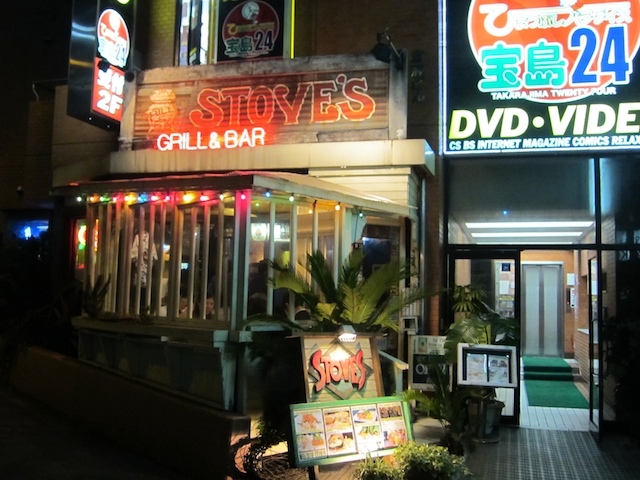 Stoves is very tricky to find if you are not a local – but should you find yourself in the Yokohama Train Station / Mall (1 million visitors a day) exit the mall towards Vivre (a shopping mall for the young set), cross the bridge over the river, make an immediate left and walk to the corner – it’s worth looking for! 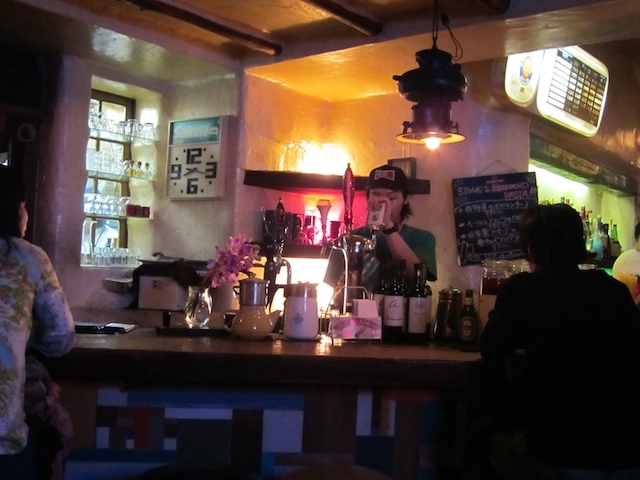 Check out Todays Special on the left over the ‘wine rist’ – all the Jamon Serrano you can eat in 90 minutes for 900 yen (about $11) – famous for their cocktails I had the Havana Club Rum and coke, my favorite! 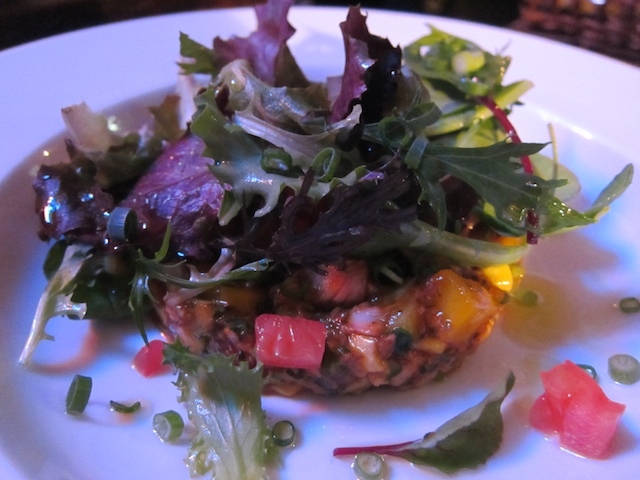 The burger dishes looked amazing coming out of the kitchen, but we focussed on appetizers and salads. To figure out the pricing, add a decimal after the last two digits and add about 20% – so 1000 Japanese yen is about 12 bucks. 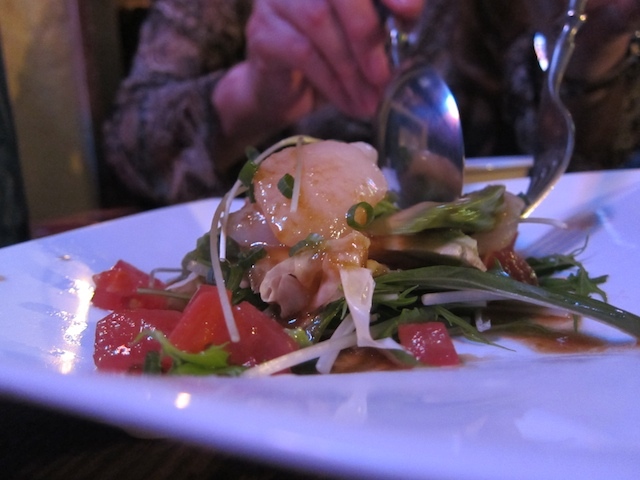 While the menu looks pretty standard, each dish was far more than you would expect and kicked up with innovative concepts and ingredients, prepared with outstanding skills, and artfully presented. 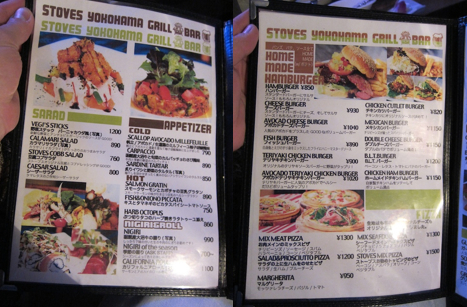 The menu changes regularly. First Course – Scallops Avocado Millefeuille: A French term for a layered dish – this one started with fresh mizuna (think skinny Japanese lettuce) and greens topped with avocado slices, tomato chunks, baby asatsuki negi (like a mild leek, there are several styles and they are very popular here), pickled ginger and finally scallop sashimi – dressed in Yuzu Kosho (yuzu is a citrus fruit, kosho is a spicy, citrussy pepper rub). This dish was spicy, stunning and so good, we ordered two! 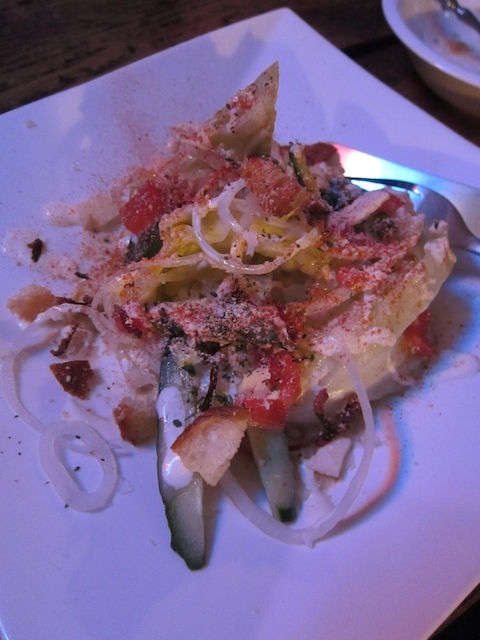 Second Course – Caesar Salad: Fresh iceberg lettuce, Japanese cucumbers, onion, bacon, croutons, tomato, parmigiano reggiano, togarashi (mild dried chiles) and a creamy Caesar dressing. A yummy variation. Third Course – Sardine Tartare (Below): Boneless raw sardines, minced and blended with mango, Japanese cucumber, cilantro and canola greens (from the family that canola oil is made from – also very popular here) and cilantro) in a umeboshi dressing (salty and very tart pickled plums), shaped into a patty and topped with an herb pesto, fresh mizuna and spring greens, tomatoes, asatski negi and vinaigrette. Delicious and exploding with exotic flavor. 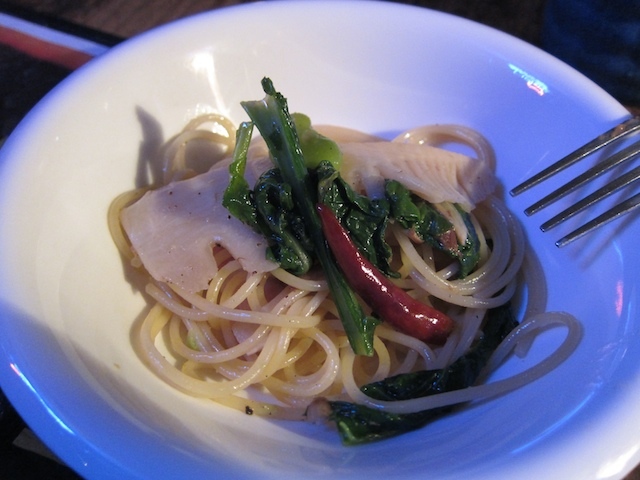 Fourth Course – Pasta of the day; Pepperoncino: The Japanese name for a popular local version of Aglio Olio (pasta tossed with olive oil, peppers and garlic), in this case it was paired with fresh bamboo, canola greens and fava beans. Truly stunning! 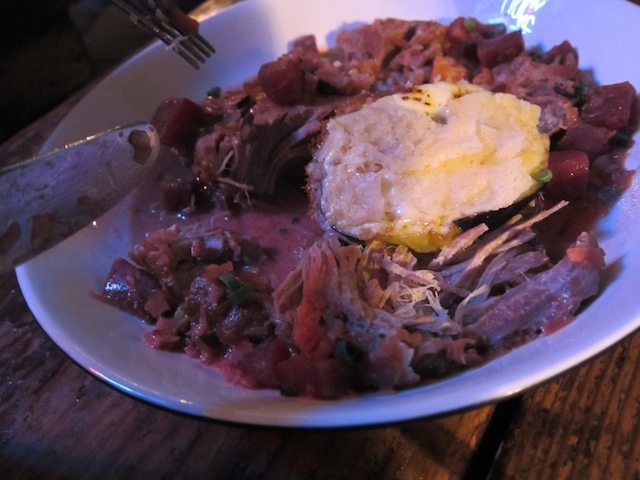 Fifth Course – Pork Confit: Slow braised Kurobuta pork (most likely shoulder), topped with slices of fried pancetta, smothered in a miso beet sauce (with eggplant and beet cubes) and finished off with a medley of cheeses au gratin. Amazing and my favorite dish of the night! 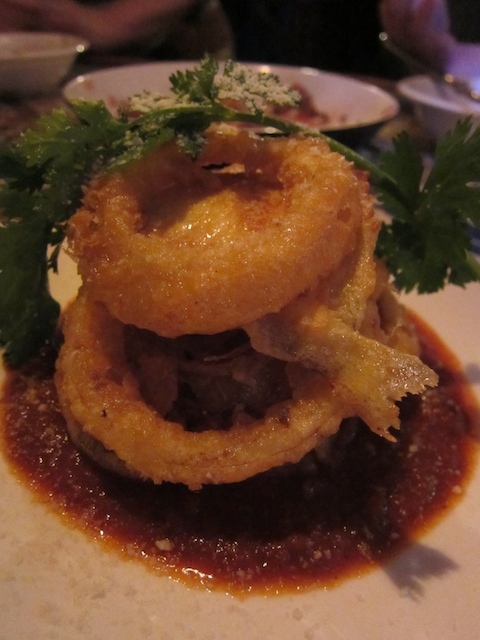 Sixth Course – Kitsu Onion Rings: Fresh onion rings and mild local whitefish, breaded and fried and served in a stack over a rich and spicy tomato piccata sauce. Garnished with cilantro and grated parmigiano reggiano. Some of the best darn onion rings I ever tasted, and the fish was amazingly mild. Seventh Course – Carpaccio: Thin slices of Hohnuma Beef (cherished Wagyu beef from Hokkaido – think Kobe beef, but not from Kobe. Wagyu is raised all over the country and each region has it’s own special characteristics.) 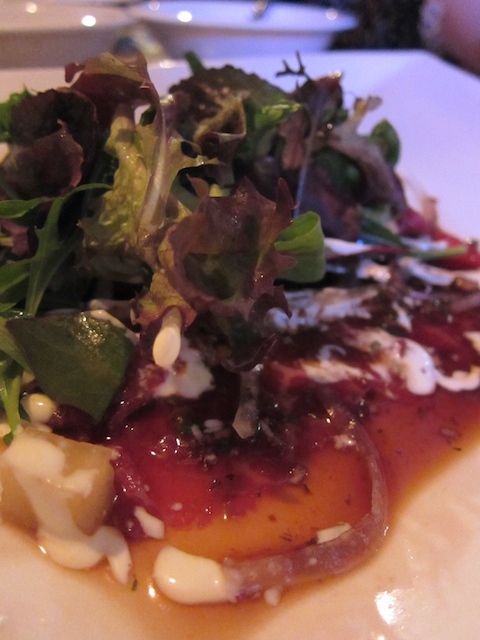 The slices of beef were in a vinaigrette that I believe included (but was not limited to) balsamico di modena, olive oil and wasabi – topped with pineapple, tomatoes, onions and Kewpie mayonnaise, and then finished with spring greens. Very exotic and loved by all. 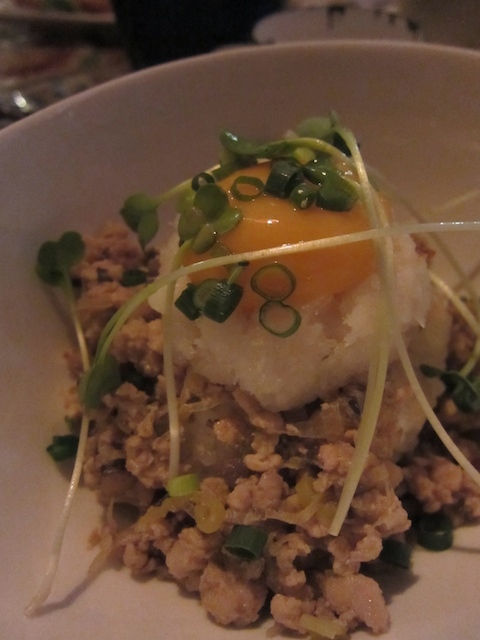 Eighth Course – Tori Soboro (below): Ground chicken thighs, seasoned and sauteed with negi. 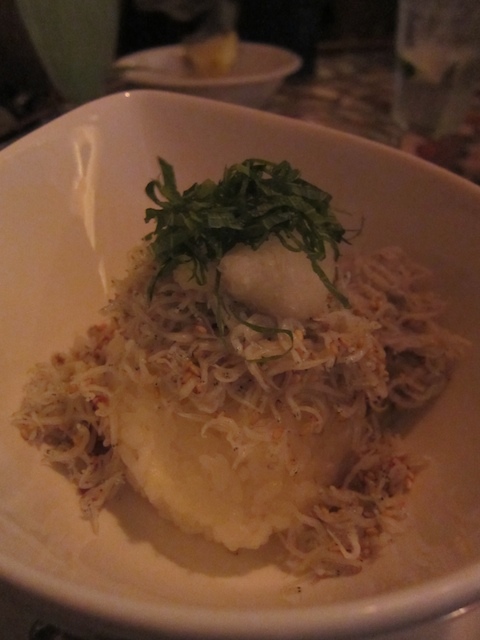 Served over steamed rice and topped with finely shredded daikon, a raw egg yolk, radish sprouts and scallions. Stirred together and eaten with shoyu – it was gone in seconds. Ninth Course – Shirasu Don (above): Steamed riced topped with boiled shirasu (tiny half-dried fish with an amazing taste and texture – I love these little fishes and add them to my rice and salads at home all the time) the fishes were flavored with umeboshi, togarashi (mild chile seasoning), and sesame seeds and then topped with shredded shiso leaf (minty and herbal, often served with sashimi and regular in my garden at home). They were hoppin’ behind the bar all night! A fabulous time was had by all, despite the thick cigarette smoke (reminds me of the old days…) This is not a typical meal here in Japan, message here is that the world of food is so much grander than most of us sheltered Americans can imagine – when you travel, leave your inhibitions behind and eat with an open mind. Cheers!